Are you an extreme sports fanatic? Do you live for the thrill? 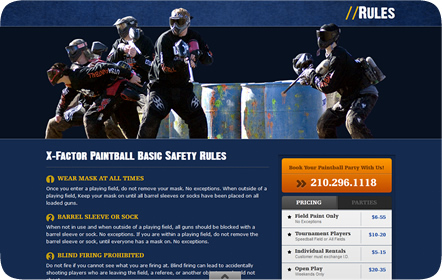 Then XFactor Paintball in San Antonio is the place for you. Multiple fields for every style and preference of play make for a fun and unforgettable experience. XFactor offers party packages, team clinics and private lessons for all players. 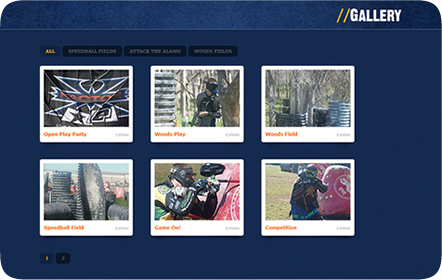 With a knowledgeable and enthusiastic staff, there’s no way you can go wrong with playing a few rounds of paintball here. 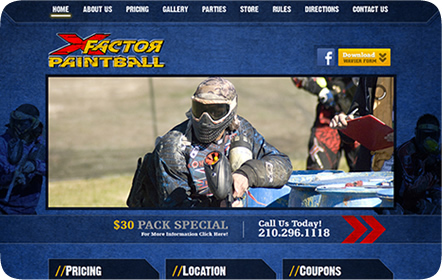 With XFactor’s website, we had a very clear idea in mind of getting their name known and recognized in San Antonio by conveying excitement and fun. We wanted to make them look like it’s a place you want to visit. Custom photography of players in action and a large slider on the front page pushed the idea of high-octane action at every turn. 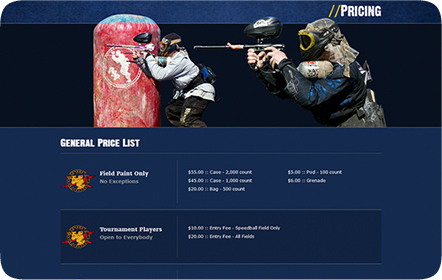 We built their website to be very interactive while still being easy to read and navigate. Bringing in new customers to XFactor was a major focal point, so presenting the most important information up-front was a decision we felt was adequate for their business and their brand.